I used to say I was in the business of teaching art, I now say that I am in the business of building confidence. A lack of confidence in one’s own ability and a fear of failure are the 2 biggest hindrances to my job as an art teacher. Fear comes in various forms so I will elaborate here a little and tell you what I am not talking about to begin with. Some fear is based upon experience. I am talking about if you fell in a pool when you were 3 and nearly drowned. You might then develop a fear of pools, or fear of any water, fear of learning to swim even. The second fear I am not talking about is a calculated fear and it goes something like this. You have never been attacked by a shark although you imagine that being in the jaws of one would be painful and scary. So, due to this you may never swim at a beach even though the odds of being attacked are quite low, but there are still odds, right? The fear I am talking about is self-doubt. It’s that inner voice telling you that you can’t. It’s your competitiveness comparing your ability or lack thereof to everyone around you. Once you make this comparison you then rate yourself, not very accurately I might add. It’s evolved from absent minded comments from those around you, lack of self-belief and from a fear of failing. The worst part is that adults have more self-doubt than children! They have had years of conditioning, experiences and failings to have convinced themselves that they can’t draw or paint? See if you don’t try you can’t fail, right? WRONG. If you don’t try then you have no chance of learning, developing and succeeding. You might be wondering if I am a trained Psychologist or Art Therapist. I am neither. I have had training in behaviour management which taught me to observe. And I do teach approx. 100 kids every week in my studio and have had the awesome experience of teaching hundreds elsewhere and this is what I have learned and know to be true. This is what I see week in week out with so many children of different backgrounds, religions, personalities and sizes. Fear of failing and a lack of confidence is very common with the kids who join our classes. The first time I meet a new student I observe their actions and their words. I am sure most parents would be shocked to hear that I take little notice of their artwork on the first day. Some kids are just nervous, but most fear failing. What are they so afraid of? That I won’t be impressed with their efforts or that they can’t deliver under pressure. That their drawing won’t look real enough or that all the other kids are better than them. If I had a dollar for every time a student told me they couldn’t. I can’t draw that? But I never listen to them. 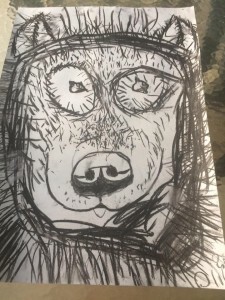 The image I have included below was a wolf drawn by a 5-year-old. I did not help him as in draw it for him, I told him step by step what to do with his little sticks of charcoal. This 5-year-old has not developed self-doubt yet. He is confident and ready to take on the world.! So, you might be wondering about natural talent? I have been asked, can you teach anyone or do people need to be gifted? Well the answer is yes I can teach anyone. I say this for 2 reasons. Firstly, all I need as a teacher is a student who is willing to learn. I can show you how to draw a building in perspective and what would be the measure of my success in this activity? That you draw it like an architect or that you understand and attempt to draw the building in 3 dimensions showing appropriate attention to proportion, measurement, line etc. It’s the latter, you see it’s not how amazing you or I for that matter think the drawing is. It’s that you have demonstrated the principle I am trying to teach which you can only do if you have a willingness to learn. Secondly, art is personal expression and is difficult to measure, as such. Yes, I can tell whether a student has gotten a certain principle or not, whether they understand and use cool and warm colours for example. But I do not grade their work, how can you? You either like it or you don’t. That is what being an artist is all about and so for a student to produce a piece of art that brings emotion and enjoyment to another achieves one of my goals as a teacher and guess what anyone can do that! Whether it’s an abstract piece or a detailed print, anyone can produce a piece of art that brings them and others enjoyment. There are so many roadblocks to the start of our art leaning journey and my job is to tear them down one by one. Now don’t get me wrong. This confidence building is not misplaced nor is it superficial. I do not tell a child you can paint just like Leonardo Da Vinci this week. You see teaching art is about training, learning technique, and yes failing, starting again, trying new things and practise! Just like any other thing, you need to practice. I do however give students tasks that they believe are punching above their weights. They do tell me they can’t, they whinge and squirm and whine and wiggle. I simply smile and tell them what to do, chunk by chunk. Art is a process, it’s about layers. Kids see the finished product of 20 layers and their fear of failing kicks in. But if I tell them to put a little circle about 1/3 of the way up, they realise at the end that the circle was the beginning of a snout. I break it down for them into manageable steps of success. Once I get a student to produce one piece of work step by step I reckon I have a 95% success rate of their confidence puffing out their chests and lifting up their chins. They then run through my door next week, asking Miss Tammy what are WE doing today? I LOVE to surprise them and their parents with what they can achieve. I often bite off more than I can chew in my curriculum planning because I believe they can do it! I believe we are all still learning together and that the process is more important than the outcome. Art lessons is so much more than colour theory and making a mess. It’s about building confidence, developing an “I can” attitude. Do you want your child to be confident? Do you want them to try new things, to experiment with processes and outcomes? To make up their own minds, and to not be held back by doubt? Art lessons do all these things which are so much more important than a beautiful painting. If you want your child to be confident in general, to grow up and take on the world, enrol them in an art class today! Hi Tammy, how wonderfully written!! I was really moved by that. Keep up the awesome work. Cheers Deana ?